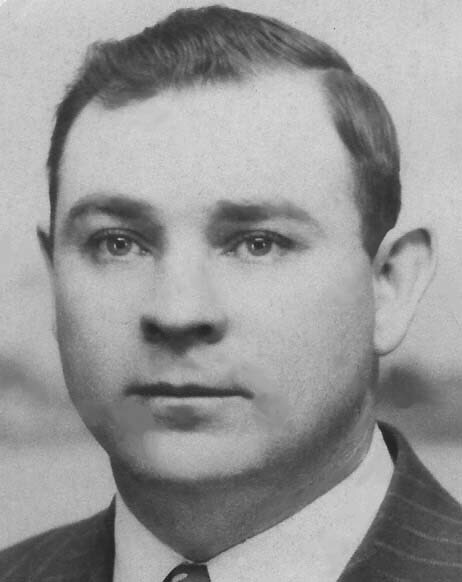 He married Amanda Lou Swearengin2,3,4,6,7 [Mandy Swearengin6,8], Feb 17 19232,3,4,6,7. 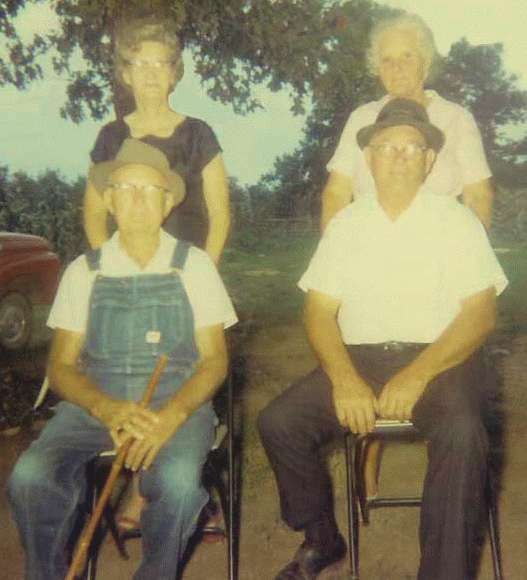 Amanda, daughter of Albert David Swearengin & Wade Hampton (Bishop) Sanders2,3,4,5,7,8,9,10, was born Feb 25 19072,3,4,5,7,8,9,10, Estillfork, Jackson County, Alabama2,3,4,5,7,8,9,10 [Swaim, Jackson County, Alabama6]. Note that Ernest's sister Rosa married Amanda's brother, John David Swearengin. 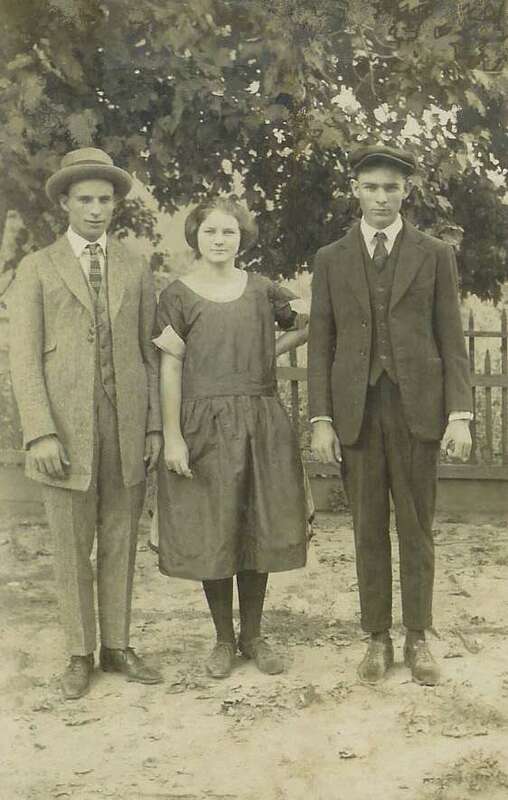 Hinshaw, Earnest W., head-of-household, age 25, born in Alabama; parents born in Alabama; first married at age 19; rented home; no radio in home; occupation: farmer, general farm; not a war veteran. Hinshaw, Amanda, wife, age 23, born in Alabama; parents born in Alabama; first married at age 17. 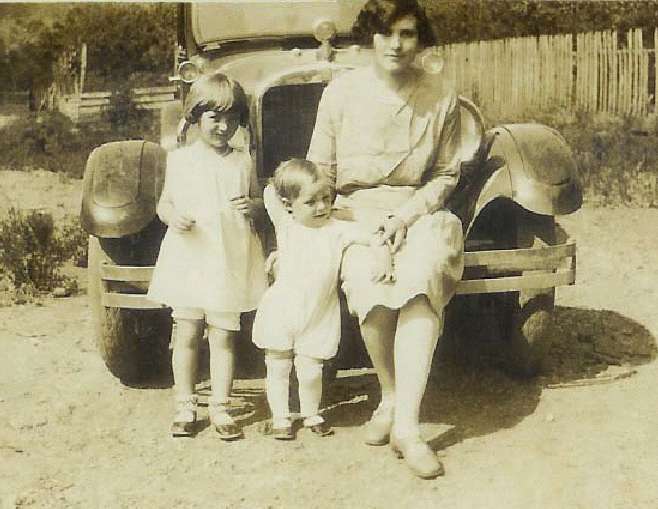 Hinshaw, Edith G., daughter, age 3 years 10 months, born in Alabama; parents born in Alabama. Hinshaw, Lois H., daughter [sic], age 2 years 10 months, born in Alabama; parents born in Alabama. 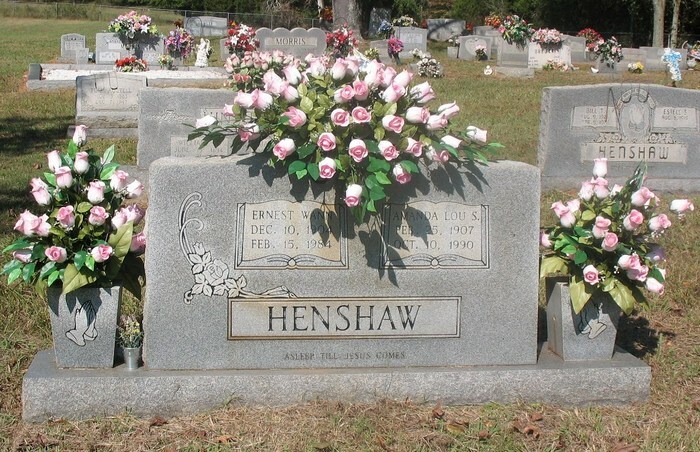 Ernest Wann Henshaw died Feb 15 19842,4,5,9, Skyline, Jackson County, Alabama2,4,5,9 [Scottsboro, Jackson County, Alabama6]; buried Henshaw Cemetery, Jackson County, Alabama2,4,5,9. 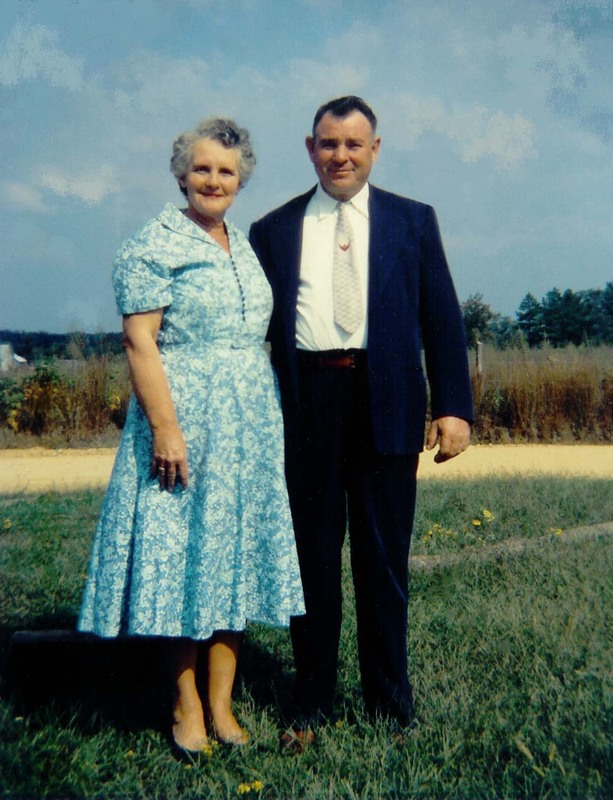 Amanda "Mandy" Henshaw, 83 of Baileytown, died Wednesday, October 10, 1990 at the Jackson County Hospital. Funeral services will be conducted Saturday, October 13, 1990 at 2 p.m. from the Bostick Hill Methodist Church with the Rev. Robert Sims officiating. Burial will be in Henshaw Cemetery. Visitation will be Friday from 6-9 p.m. at the Scottsboro Funeral Home. 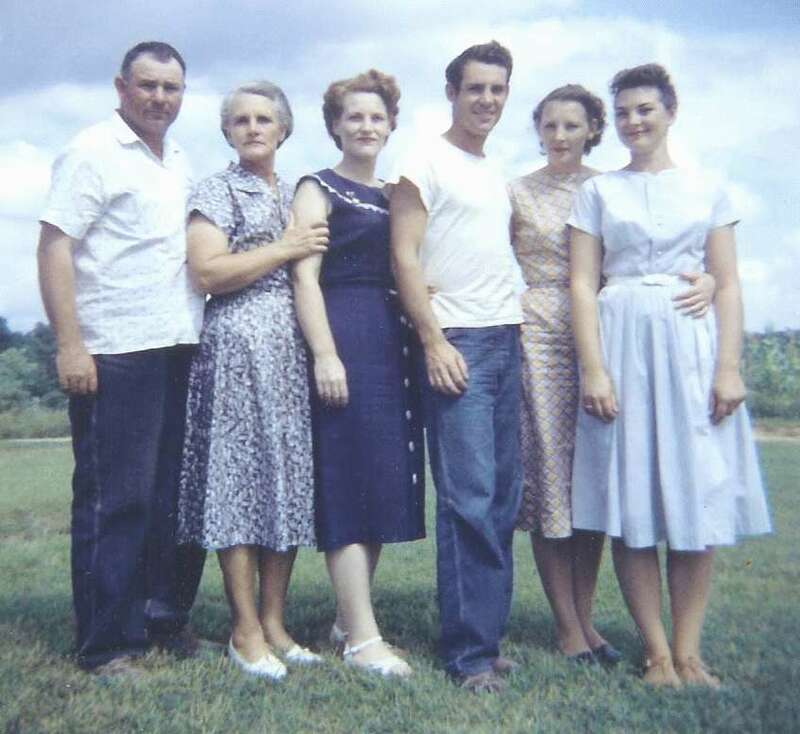 Surviving are three daughters, Edith Morris, of Skyline, Elsie Faye Bailey, of Baileytown, and Jimmie Dean Prince of Harvey, Ill; one son, Lois Henshaw of Baileytown; nine grandchildren; eleven great-grandchildren; two great-great-grandchildren and several nieces and nephews. 1930 census, Bishop Precinct, Jackson County, Alabama; roll T626-20, ED 23, page 4A, line #5, dwelling #73, family #73. Contribution from Phyllis Joan (Morris) Fisher. 1910 census, Bishop Precinct, Jackson County, Alabama; roll T624-16, ED 38, page 4A, line #8, dwelling #60, family #60. 1920 census, Bishop Precinct, Jackson County, Alabama; roll T625-19, ED 40, page 7B, line #78, dwelling #14, family #15. 1930 census, Bishop Precinct, Jackson County, Alabama; roll T626-20, ED 23, page 4A, line #3, dwelling #72, family #72. 1930 census, Bishop Precinct, Jackson County, Alabama; roll T626-20, ED 23, page 4A, line #16, dwelling #75, family #75. 1930 census, Bishop Precinct, Jackson County, Alabama; roll T626-20, ED 23, page 4A, line #18, dwelling #76, family #76. 1930 census, Bishop Precinct, Jackson County, Alabama; roll T626-20, ED 23, page 4A, line #24, dwelling #77, family #77. Photo courtesy of Phyllis Joan (Morris) Fisher.